No other country has an expanse of fresh water like the Great Lakes, nor such treacherous shipping conditions. Tempests roaring in off the grasslands to the north can whip up 25-foot (8-meter) waves in a matter of hours on the shallow-bottomed lakes. In the days before satellites, hundreds of giant ships met tragic ends in these furies. Like an obsessive maritime archivist, Lake Superior snatched ten ships from the surface waters surrounding Isle Royale National Park during the 19th and early 20th centuries. 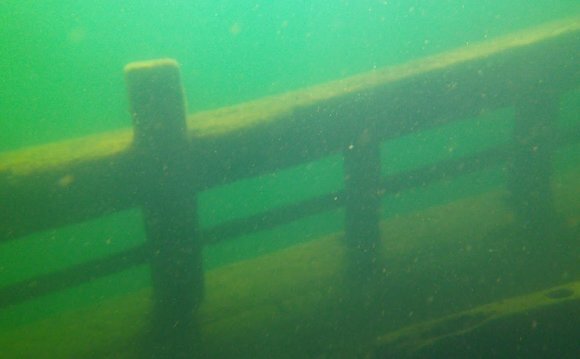 What distinguishes the Isle Royale wrecks is their frozen-in-time quality. Unlike ships in warm salt water, which quickly become encrusted with corals and sponges—or, in the case of wooden boats, decompose completely—Isle Royale’s ghost ships remain pristine. And national park rules protect them from souvenir hunters. On the corpse of the 250-foot (76-meter) freighter Kamloops, sent to the bottom in 1927, the cargo hold contains wooden crates filled with small silver cylinders bearing a familiar label: Life Savers candy. 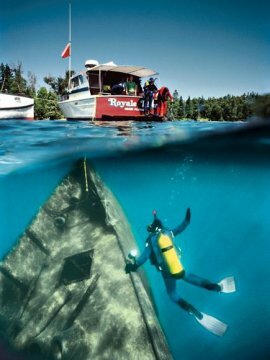 The wrecks’ tight interiors and Lake Superior’s 34º to 38º (1° to 3° Celsius) water temperatures make diving at Isle Royale an affair for intermediate or expert divers only. Full wetsuits or dry suits are mandatory, and a live-aboard vessel is necessary given the island’s remote location. On a four-day bunk ‘n’ dive trip with Blackdog Diving out of Grand Portage, Minnesota, days are devoted to exploring haunted hulls, while evenings are spent anchored in a wild cove on the island’s north shore admiring the sunset as the steaks grill.